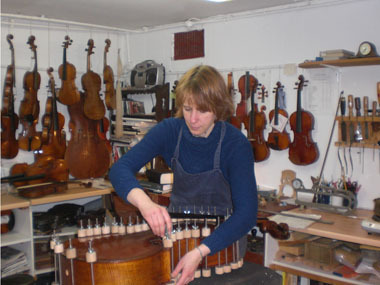 The Old Violin Workshop in Hampton Hill, Middlesex supplies a wide range of violins, violas and cellos, including instruments for children starting to learn music right through to concert grade instruments for professional performers. As well as selling new violins, we also restore good quality older instruments in our workshop, and pride ourselves in setting these up for optimum sound and playability. We also offer a comprehensive repair service at economical rates. Drop in, or call us, to discuss your requirements. We carry out all the work ourselves on the premises and are always happy to provide assessment and advice on the best course of action for your instrument. We are located in Hampton Hill in the London Borough of Richmond upon Thames, within easy reach of Teddington, Twickenham, Hampton Court and Kingston. "The Old Violin Workshop's new repair shop is a real asset for string players in the area. Sophie and Hugh give very knowledgeable advice about the purchase and maintenance of all instruments of the string family. Repairs and rehairs are done reliably, skilfully and at very reasonable cost. They also give advice on good starter instruments which are well set up and ready to play. I thoroughly recommend a visit to the Old Violin Workshop to all my pupils." Richmond Music Trust, String Tutor.